Composed of a thin film of strong nonconductive adhesive. Size of adhesive area is 7/16" (11mm) diameter which is appropriate for 1/2" SEM pin and cylinder mounts. Place the "press" portion of the tab on an SEM mount surface. 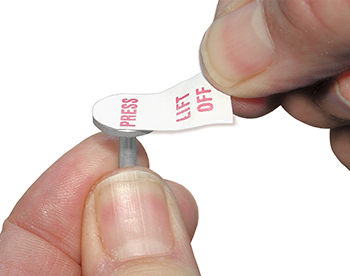 After pressing, pull tab up and a thin layer of adhesive is left on the mount surface. Contents: 72 sheets, total of 2,592 tabs. 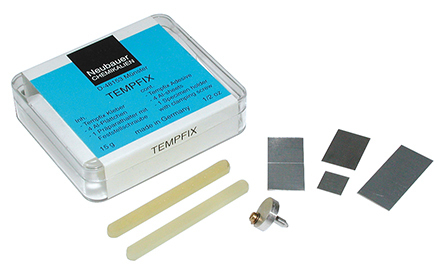 Tempfix is a non-conductive thermoplastic hot melt adhesive resin, especially formulated for SEM studies. It does not contain solvents and is stable under high vacuum. Its adhesive characteristics appear in the 40-120°C range. Melting starts at 40°C and it becomes a thin fluid at 120°C, displaying a wide viscosity range. It has a very smooth surface and can be used in SEM imaging without interfering background. Preparing specimens requires a hot plate or heating block, aluminum sheets of 10x10x0.25mm used as specimen mounts, a metal cooling block and a pin stub type specimen holder with a side clamping screw on top. The aluminum sheet is warmed up to about 120°C and a small amount of Tempfix is applied and smoothed over the sheet. Excess resin is removed. After the sheet has cooled down, Tempfix is a solid smooth plastic surface. Particulate or other small samples may be sprinkled or applied on the solid plastic surface and the sheet is gently heated above 40°C to the desired viscosity. Use temperature to control viscosity and how far the particulates "sink" into the adhesive. Remove the sheet and cool it quickly on a metal block. Delicate specimens will likely not suffer heat damage. A thin conductive coating (sputtering or evaporation) might be needed for optimum imaging results. The aluminum sheet with the specimen can either be mounted on the supplied pin mount adapter with clamping screw or can be mounted on a specific SEM mount with a conductive adhesive carbon tab. The PELCO® High Performance Ceramic Adhesive has been especially developed for bonding and sealing ceramics, metals, quartz and glass for high vacuum, high temperature and cryo applications. It is a dispersion of alumina in an inorganic silicate aqueous solution. Comes in the form of a paste and can be easily applied with a brush or a spatula. Good mechanical strength is achieved within minutes at room temperature. Curing schedule is 2 hours at 93°C (200°F). Full properties are reached after curing. It provides both low electrical and thermal conductivity. Sold in 2 sizes: a container holding 1 pint (473ml) or a container holding 50 grams (approx. 22ml). Ultrathin sticky base, clear, suitable for small particles which are submerged by other adhesives. Applications cited include organic powders, pollen, seeds - for attachment to an SEM stub. Can be diluted with MEK. Dries quickly. Nonconductive. The PELCO® Pro cyanoacrylate based instant or super glues are ideal for repair, sample preparation, assembly and bonding dissimilar materials. Clear, fast curing cyanoacrylate without mixing or additional heat applied. Available in sets of small tubes with 5x2gr, 20ml bottle with dispenser tip or 20gr dispenser tube. To cover a large range of applications, different viscosities with different curing times are offered. The shelf life of cyanoacrylate glues (and epoxies) can be extended by storing them at lower temperatures; -20°C. At lower temperatures, the adhesive becomes very viscous and the speed of chemical reactions is practically reduced to zero. It will keep the adhesive stable for years. Before use, let the adhesive thaw with the container sealed to avoid condensation into the adhesive. PELCO® Pro C100 CA glue has a viscosity of 100cps and a curing time of 4-10seconds, clear. Use to bond plastic, glass, ceramic, rubber to metal with moderately smooth surfaces, not ideal for porous materials. General purpose cyanoacrylate glue. Suitable for many applications. PELCO® Pro F5 CA glue is a very fast bonding cyanoacrylate with a viscosity of 5cps with a curing time of 2-4 seconds, clear. Use for high speed bonding of dissimilar materials with smooth surfaces and minimal gap (0.002” / 50µm), superior wicking properties. Not suitable for porous materials. 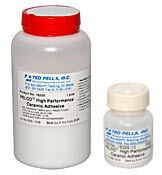 PELCO® Pro C5 CA glue is a fast bonding cyanoacrylate with a viscosity of 5cps and a curing time of 5-10 seconds. Use to bond any combination of metals, glass, plastics, rubber, ceramics or glass with smooth surfaces and minimal gap (0.002” / 50µm), excellent wicking properties. Not suitable for porous material due to the low viscosity. PELCO® Pro C300 CA glue has a higher viscosity with a longer curing time. Ideally suited when more careful positing is needed, surfaces are not smooth or for gaps up to 0.006” (150µm). Curing time 10-15 seconds. PELCO® Pro C1000 CA glue has a high viscosity and a longer curing time. Ideally suited when more careful positioning is needed, surfaces are not smooth or for gaps up to 0.008” (200µm). Curing time 10-15 seconds. PELCO® Pro CA-Gel glue is a gel type cyanoacrylate with high viscosity, excellent gap fill up to 0.10” (250um) and extended curing time 20-25 seconds. Use to bond rough surfaces and repositioning after initial contact. Can also be mixed with Fine Conductive Powders below for a super fast drying, conductive adhesive. High purity, high density fine conductive powders for making conductive adhesives or embedding materials. Can be mixed with epoxies or for making conductive embedding material or conductive cement. Can also be mixed with cyanoacrylate gel for a super fast drying, conductive adhesive to mount specimens. Available as silver, carbon (graphite), and nickel powder. 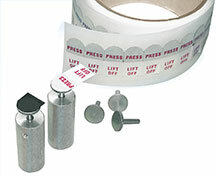 The PELCO SampleBond Adhesive has been especially developed for sample bonding to supports. It is a thin, fast curing cyanoacrylate type adhesive which can be used as a cleaner alternative to wax for mounting samples to glass for TEM/FIB thinning procedures. Ideal for bonding metals, silicon, ceramics and other non-porous materials to similar materials or to glass. Can also be used to bond thin samples together for cross section procedures. 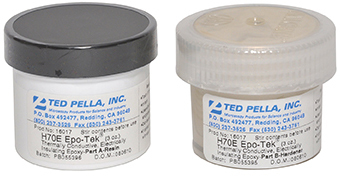 Samples glued with PELCO SampleBond can be easily debonded (removed) from the support by using #19920 PELCO® Pro Cyanoacrylate Debonder. 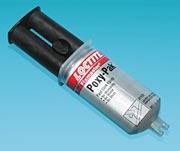 Supplied in 20ml bottle with dispenser tip, closed with PTFE coated steel pin for optimum seal. 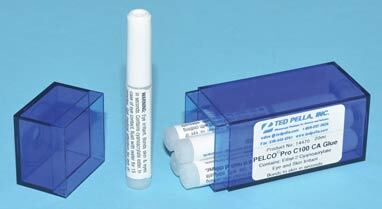 PELCO® Pro CA44 is an instant tissue adhesive based on cyanoacrylate. Developed to glue tissue on specimen holders used in vibrating microtomes such as the PELCO easiSlicer™, Microslicer™ and Vibratome®. Although the tissue adhesive is unstable in boiling water, it is recommended to use#19920 PELCO® Pro Cyanoacrylate Debonder to remove or clean cured cyanoacrylate. Supplied in 20ml bottle with dispenser tip, closed with ptfe coated steel pin for optimum seal. Comparable to Loctite 404 tissue adhesive. 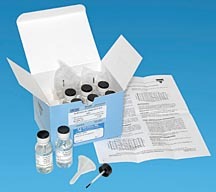 Conveniently packaged kit with PELCO SampleBond Adhesive for sample bonding on glass supports and PELCO® Pro Cyanoacrylate Debonder (see description below) to remove the sample after thinning. Kit contains two ea. 20ml bottles with dispenser tips. The PELCO® Pro Cyanoacrylate Debonder destabilizes and debonds cured cyanoacrylates. Useful for releasing specimens from holders, cleaning cyanoacrylates from surfaces and removing cured cyanoacylates from fingers. Works on all brands of cyanoacrylate glue (Loctite, Henkel, Permabond, 3M, PELCO®, Aron Alpha, etc.). The debonder is also a solvent, please check before using on plastic surfaces / samples and avoid repeated skin contact. Supplied in 20ml bottle with dispenser tip. No mixing, no drip, no clogged tips. Contains cyanoacrylate adhesive; comes out one drop at a time. Clear, same as type 201. Bonds in seconds. Dries fast, clear, tough. For china, glass, wood, metal, leather. Contains acetone and butylacetate solvents. Nonconductive. Sold in tube of 29.5ml (1 oz.). General-purpose, clear RTV indoor/ outdoor sealant. Seal, bonds, repairs, mends and secures glass, metal, plastics, fabric, vinyl, weather stripping and more.. May be applied to horizontal or vertical surface. 72 hour cure time. Provides a 20 minute fixture time. Delivers great performance with a shear strength of 200 psi, tensile strength of 400 psi and peel strength of 40 pli. Operating temperature range is 175°F + 400°F (-59°C to 204°C). 2.8oz tube. Super fast 2-part epoxy resin cement for bonding applications. Sets in minutes. Full bond overnight. Stick polymerized specimens on aluminum Specimen Slug Mounts. Will not dissolve in acetone or alcohol. Use PELCO® Fine Silver, Carbon, or Nickel powders to make electrically conductive epoxy. Dual dispersing syringe, 29.5ml (1 oz.). PELCO easiSlicer™ and other vibratory tissue slicing applications. Also for other quick-set tissue-slide uses. Loctite® 460 is a fast curing thin glue which can be used as an alternative to wax for mounting samples to glass for TEM/FIB Thinning. Soluble in acetone. Sold in bottles of 0.70oz. / 20g. Fast cure, 2-part, high strength, thick liquid reaches handling strength in 4-6 minutes. Bonds virtually any material to repair, fill and seal holes, cracks and worn surfaces. Dual dispersing syringe, 29.5ml (1 oz). Can be made electrically conductive by mixing with Fine Silver, Carbon, or Nickel powders. This is a nonconductive, two-component, solvent-thinned, epoxy-phenolic adhesive for high performance applications. Chemically resistant and provides a thin layer of glue which has good ion milling properties. It has low viscosity and is extremely thin, with minimum creep, hysteresis and linearity problems. Solids content is 22%. It is an excellent adhesive for mounting samples for TEM dimpling and bonding of samples to TEM grids for imaging or FIB. Operating temperature range, short term is -269° to +370°C; long term, -269° to +260°C. Elongation can occur at +24°C (3%). This may be the widest temperature range general-purpose adhesive that is available. A kit contains: 4 bottles (14g each) Resin, 4 bottles (11g each) Curing Agent, 4 brush caps for dispensing mixed adhesives, 4 disposable mixing funnels and instructions. EPO-TEK® H70E is a two component, thermally conductive, electrically insulating epoxy designed for chip bonding in microelectronic and optoelectronics applications. It is an excellent heat-sinking adhesive and is recommended for thermal management applications where good heat dissipation is needed. EPO-TEK® H70E exhibits excellent handling characteristics and an extremely long pot life at room temperature. 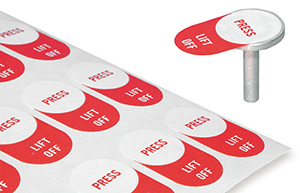 Easy to use; can be screen printed, machine dispensed, stamped or hand applied. Excellent adhesion to ferrous and non-ferrous metals, glass, ceramic, kovar and PCB. Can be cured very rapidly. Two part thermally conductive epoxy with superior physical properties. Filled with high purity aluminum oxide to provide excellent thermal conductivity at reasonable cost. Pigmented black for excellent thermal absorption and emission. Not electrically conductive. Can be used to mount samples or parts where heat dissipation is needed. Can also be used to encapsulate components or assemblies for heat dissipation, protection and shielding. Excellent adhesions to metals, ceramics, glass and most plastics. Easy to mix with a mixing ration of 1 to 1. Up to two hour pot life; curing dependent on temperature. Supplied in two containers of 225g/8 oz each (resin and hardener); total 450g/16 oz. Complete with mixing cups and mixing sticks. Good chemical resistance against Isopropanol, Mineral Spirits and Isohexanes. Moderate chemical resistance to HCl, Acetone, Xylene, and Ethyl lactate. Glue Guns provide practical adhesive uses for certain applications. Leo Barish’s papers referenced below and others not mentioned cover this subject. A thermoplastic glue stick is used with a gun-type design to melt the glue and allow its application, for example, to an SEM specimen mount. Heavier and/or larger specimens, which might move during study when held with a tape or disc adhesive, will hold firmly in place when this type of adhesive is used to "seat" the specimen. Carbon coating the specimen and the adhesive will permit an electrical discharge path. A lower temperature range (100° to 120°C / 212°- 248°F) is preferable, such as our model 16068 to avoid possible damage to heat sensitive specimens. 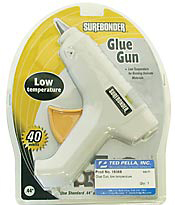 (Normal temperature for standard high temperature glue guns is in the 190° to 210°C / 374° to 410°F range). The glue hardens quickly so the specimen should be positioned promptly upon glue application. If repositioning is required, the glue may be softened with the Glue Gun. Porous specimens such as felt with a poor discharge path may accept a track of glue over its surface to reduce such static. Granular specimens may be sprinkled onto the hardening surface. Barish L, August 1990. The Use of the Common Glue Gun in Light and Scanning Electron Microscopy. Paper presented at INTER/MICRO-90, Chicago, 19-22. Barish L, 1992. Mounting of Specimens for SEM with the Common Glue Gun. Proc 50th Ann Meeting of the Elec Mic Soc of America. pp 410-411.